MOSCOW, Russia -- Russia denied on Friday that it was waging a trade war with Ukraine to keep its ex-Soviet neighbour from establishing closer political and economic relations with the European Union. Ukraine's Prime Minister Mykola Azarov acknowledged "difficulties" at the border with Russia on Thursday but urged the media not to play up the scale of the dispute. The Ukrainian Employers' Federation reported on Wednesday that all goods destined for Russia were being held up at the border without an explanation and subjected to rigorous checks. The claim -- supported by such Ukrainian giants as the mining firm Metinvest and the beer maker Obolon -- follows the suspension in July of Russian imports from the popular chocolate brand Roshen over alleged quality concerns. The head of Russia's consumer rights protection agency confirmed on Friday that Ukrainian goods were being put to more rigorous inspections but denied that this had anything to do with politics. "We have a long and specific list of complaints ... relating to the protection of consumer rights," Federal Service for the Oversight of Consumer Protection and Welfare chief Gennady Onishchenko was quoted as saying by Interfax. "If you want to call this a trade war, then call it a trade war," he added. "But we are conducting professional work." Russia remains Ukraine's closest trade partner and is responsible for nearly a quarter of its total exports. But the authorities in Kiev are keen to reverse that dependence and have been leading negotiations with Brussels over a trade agreement that could serve as a stepping stone for Ukraine's eventual membership in the 28-nation bloc. 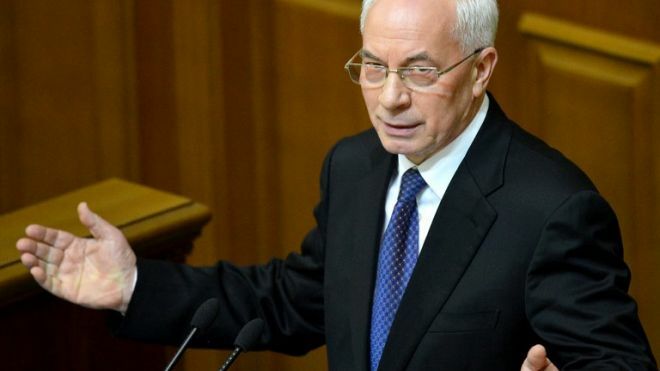 Ukrainian Prime Minister Mykola Azarov acknowledged "difficulties" at the border on Thursday but urged the media not to play up the scale of the dispute. "Do not inflate these problems artificially," Azarov cautioned. Ukraine was due to raise the issue later on Friday during a meeting in the Russian city of Suzdal of a commission overseeing trade issues in the Moscow-led Customs Union that also groups Belarus and Kazakhstan. Russian officials have said that trade with Ukraine would flow more smoothly if Kiev agreed to join the union -- something that Ukrainian President Viktor Yanukovych has thus far refused to do. Nationalist politicians in Ukraine who support closer European integration accuse Moscow of trying to force Kiev into the Russian bloc by imposing the trade restrictions.